If you want to know what strategy is you need to know Harvard Business School professor Michael Porter. He is the foremost strategy scholar. His work is by far the most cited among all strategy experts. He has almost five times as many citations as the second-ranked. Simply put, if you want to understand strategy you need to learn prof Porter’s framework. But here is the question: why does everybody keep using the same old examples? Can Porter’s framework explain the strategy of the exciting start-ups of our time? The answer is a resounding yes. In fact, it is the best tool to explain their success! Come in for an insightful journey! “Which customers are you going to serve? Which needs are you going to meet? 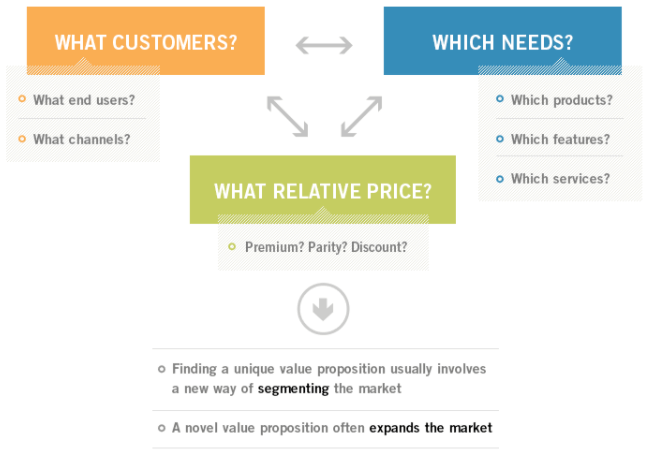 Which relative price will provide acceptable value for customers and acceptable profitability for the company? In other cases, the strategy might start with identifying a customer segment that can be served better by focusing more on them. 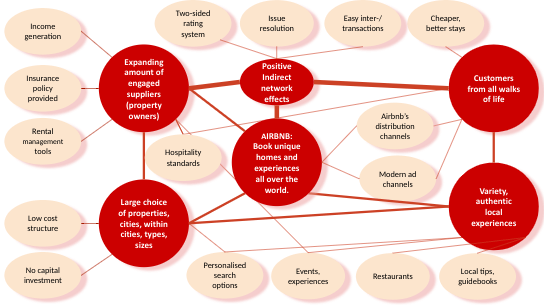 Airbnb has completely ignored business travellers and focused on leisure travellers (and price) – and only in the recent years started expanding into business travel. Traditional hotels try to please both markets. 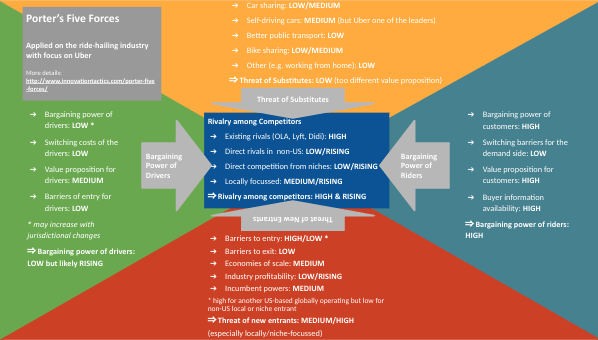 Who are Uber’s customers, their needs and the relative price? Which needs (see below for more details on the value proposition)? Note, that on these dimensions there is strong differentiation to other forms of transport. However, there is very little differentiation to other ride-hailing companies, such as Lyft in the US. That makes price an important differentiator among the ride-hailing companies. This is why these companies work on brand, advertising, loyalty and feature front running. 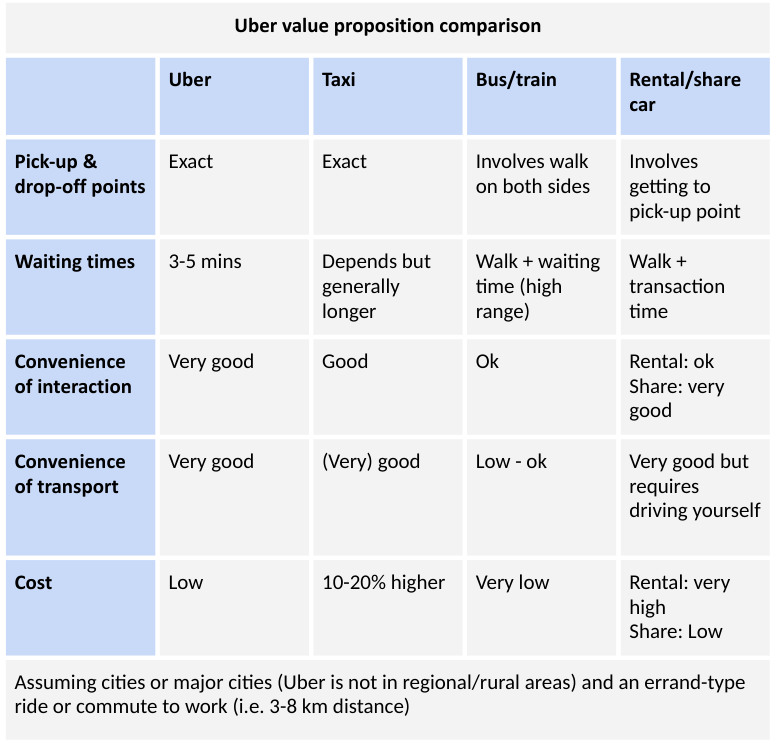 Uber is built on the platform business model which means they also have to have a compelling value proposition to their key partners (the input side, i.e. the drivers). Without a sufficient number of drivers, the value proposition for the customers will erode, e.g. through longer waiting times. Platform businesses are built on powerful indirect network effects. The value chain is a tool that helps us to understand a company’s most important activities in creating and delivering the value proposition. It describes the source of the company’s competitive advantage. The image demonstrates the idea, but you need to take it with some caution: not all elements shown are of strategic importance. You may do many of these activities in a similar way to your competition. From a strategic perspective, only those activities that you do differently to deliver your distinctive value proposition are of importance. Booking.com is an online travel agency. Like brick-and-mortar travel agencies, they sell hotel rooms and get a commission for that. Their main revenues come from selling rooms. 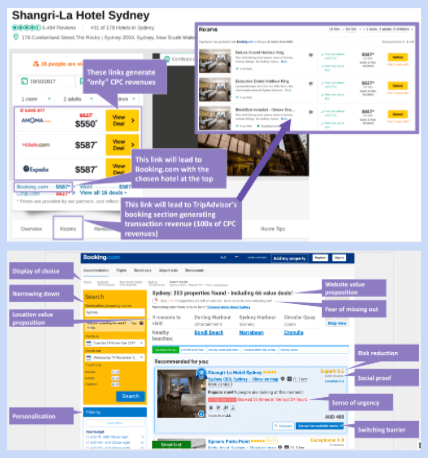 Hotels would much prefer to sell all their rooms through their own websites. But with probably the exception of the main season, they have to use intermediaries such as Booking.com to sell rooms that otherwise would stay empty. This is Booking.com’s value proposition to the hotels. And to the travellers, the value proposition is variety, guaranteed cheap prices (for the choice of hotel) and a convenient way of booking (compared to brick-and-mortar agencies). TripAdvisor’s value proposition is quite different to Booking.com’s. 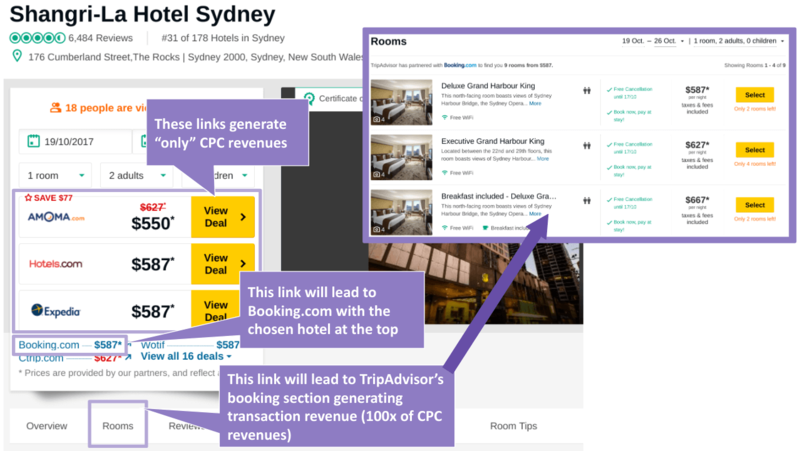 TripAdvisor sells advertising space (and high-value leads), not rooms (bare with me one second on the latter). In a way, user-generated reviews and photos are TripAdvisor’s inventory. Thus, the users who pass on reviews and ratings are the supply chain. In return, TripAdvisor makes these reviews available to all users for free. When you access the reviews for a hotel you will be also shown room availability and available prices. TripAdvisor is also a travel meta search engine that compares prices from hundreds of travel websites (including Booking.com and Expedia). This is also a value proposition for the customers who can have a high amount of certainty of finding the lowest price for the hotel of their choice. Hotels and online travel agencies can bid to be placed higher up on the list which makes it more likely to be clicked. These outbound clicks incur advertising revenues which is TripAdvisor’s main income source. The value chain links the customer value proposition with the input side which consists of outsourced activities (supply chain) as well as in-house value-adding activities. He stresses the concept of critical activities. 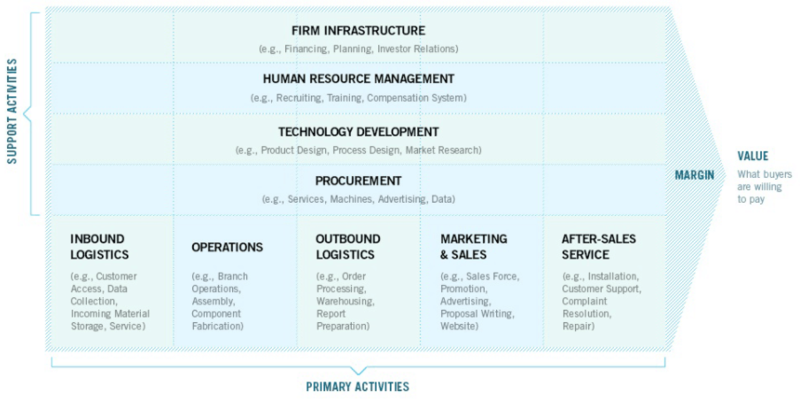 Each of the steps in the value chain really is an activity and can be subdivided into further activities (see below). The value chain also comprises the output side, i.e. distribution channels. Sign up to future articles at the end of this article and improve your innovation knowledge with in-depth articles! are the ingredients to delivering your strategy. How do you do things that are distinctive and tailored? By making choices, i.e. decisions. Trade-offs between all your options and decisions what to focus on are essential to strategy formulation. Trade-offs will lead to a different set of activities than others in your industry (or at least to doing the activities differently than others). TripAdvisor, when founded in 2000, had quite a different idea of how their pages would work: “We started as a site where we were focused more on those official words from guidebooks or newspapers or magazines. We also had a button in the very beginning that said, “Visitors add your own review”, and boy, did that just take off. Pretty soon the number of average consumer reviews far surpassed the number of ‘professional reviews,'” Stephen Kaufer, Co-founder. The founders had to make a lot of trade-offs along the way leaving their original ideas behind. The closest to their original ideas are online travel magazines with content from (semi-)professional contributors and curated content. 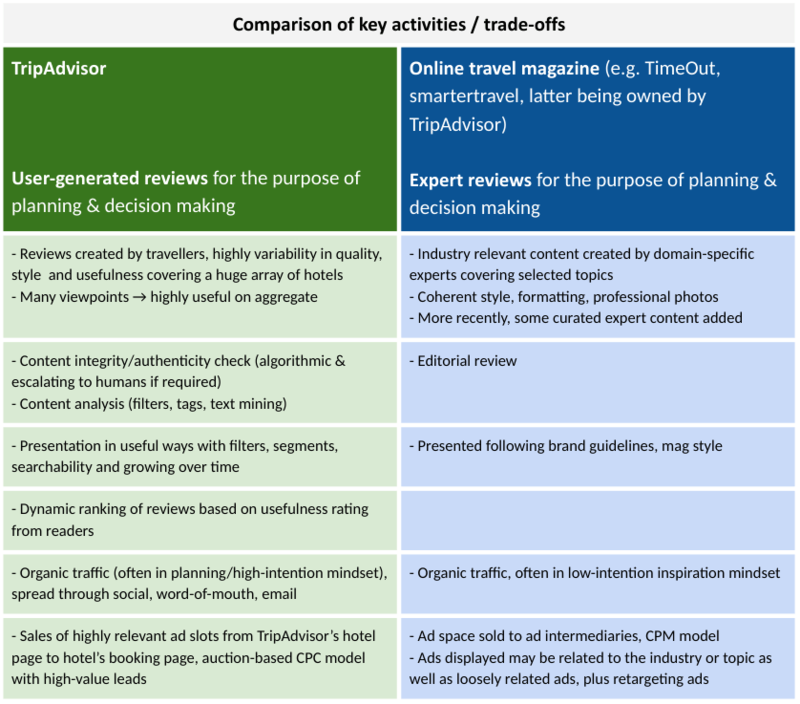 Take as an example TimeOut.com or even Smartertraveller.com (acquired in the early days by TripAdvisor). One of the early, counter-intuitive trade-offs would have been to give up on the idea of professional reviews for the sake of (ordinary) reviews. To assume that a large amount of the latter would beat professional reviews was not easy to anticipate (and experimentation has played a huge role). Here are some of the key trade-off that TripAdvisor’s founders had to make in the early days until it became the site that has defined their brand reputation as a trusted advisor. The decision to eventually focus on user reviews required many subsequent decisions, including automating many of the tasks that a traditional review magazine would do manually. Fast forward from the early days of TripAdvisor to now. They no longer competing with travel magazines. They have over time evolved into one of the biggest players in online travel agency (OTA) space. Let’s look at some more recent trade-offs in the OTA space. Each of them comes with its own value chains and set of activities. 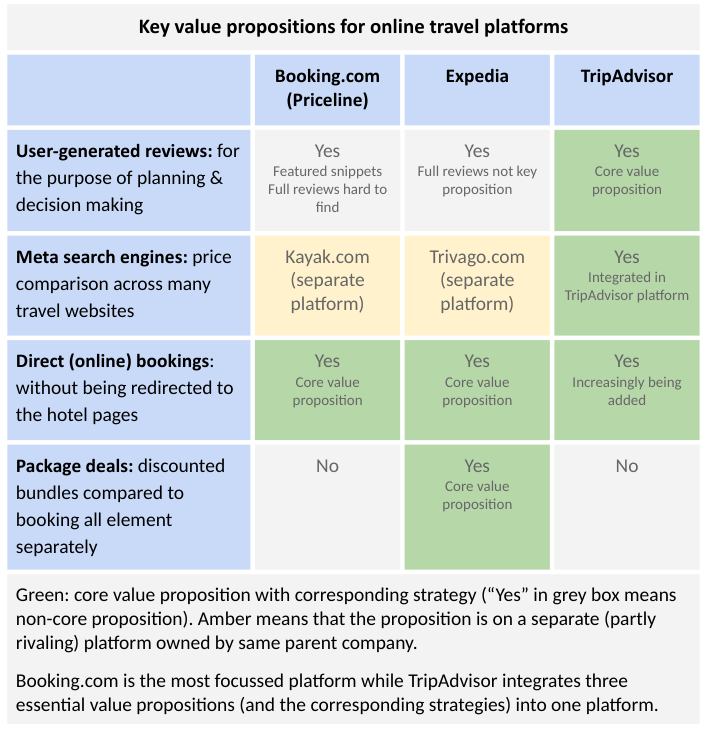 Here is which of these value propositions Booking.com, Expedia and TripAdvisor are offering. The most dangerous part about trade-offs is not to make them and to embark on too many directions. It is difficult for organisations to say no to revenue opportunities by following more than one strategy. Porter calls this attempt “straddling” and has long pointed out that companies trying to straddle between strategies are likely to flounder (“stuck in the middle”). It is easy to see in hindsight that an attempt of straddling hasn’t worked. But what about foresight? Booking.com is the most focused platform in that they only follow one strategy. TripAdvisor attempts to combine three key value propositions. Will they be able to combine all three into a new, coherent (and not yet existing) strategy? E.g., is it possible to combine the value proposition of being a trusted advisor with being a high-converting sales page without confusing the customer (and worse losing their trust)? The direct booking model requires an enormous amount of digital advertising, e.g. paid Google ads (Booking.com spends $3.3b per year on this). For this to pay off it requires very high on-page conversion rates. And this seems only achievable with very strong sales elements on their pages (“last room left,” “booked 24 times in the last hour” and so on). In worst case, in some customers’ eyes, TripAdvisor may lose the trusted advisor image. TripAdvisor is at a point where they have to do things differently. But it may well be possible to integrate direct booking in a different way to how Booking.com and Expedia have done this. I find this a very exciting space to watch. The image shows the difference. Click here for the full-size versions to understand the details: TripAdvisor and Booking.com. With this, we are now moving to our next important criteria and another exciting company: Airbnb. We are not just glossing over. InnovationTactics offers you valuable knowledge that will help you to develop innovation ideas you can be proud of! Porter says that strategy is about making choices and then (drum roll) sticking to them over time! In times that appear to be getting faster by the day, this seems to sound like a tip from our grandfather’s world. But far amiss! Uncertainty? Bah, humbug! Says Porter. He points out that some of the most successful companies have not changed their strategy in decades despite the uncertainty and change that has been brought upon every and any industry around. He dismisses the idea of harvesting low hanging fruit when it does not align with your strategy and dilutes your company’s value proposition. He also refuses the often observed frequent shifts in direction that confuse the customers, employees, vendors and other partners. One of the most interesting elements is that strategy does not require a prediction of the future. It gives you an idea what Porter means with continuity. Within these value propositions, there is a vast amount of room to innovate. Michael Porter’s Five Forces are the most important strategy tool when it comes to understanding a company within its industry setting. Some think that in today’s fast-paced times strategy is irrlevant. Applying this tool in-depth on Uber I am showing that is has not lost any of its fascination or relevance. Understand Porter’s Five Forces Now! Don't Procastrinate, Take Action Now!